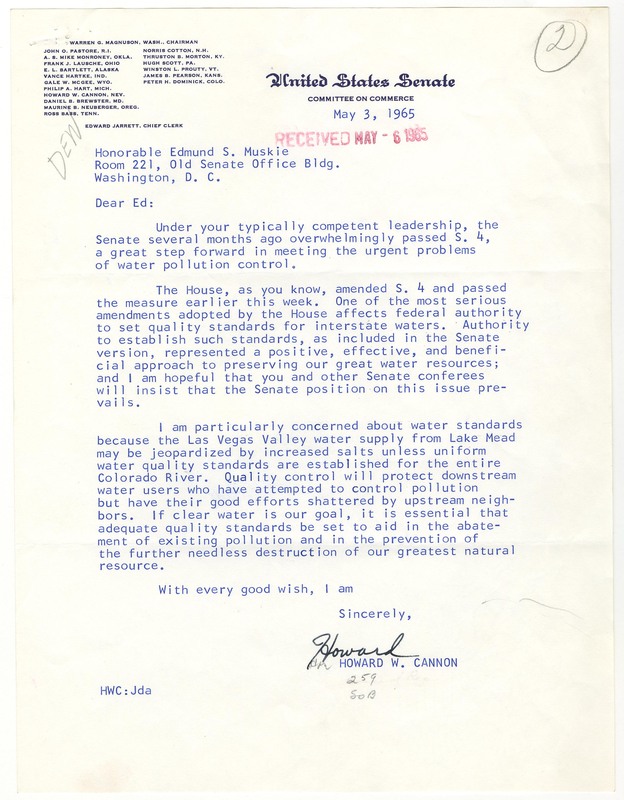 On May 3, 1965, Senator Howard W. Cannon (D-NV) wrote Muskie about the serious threat to the Las Vegas Valley water supply if the House version of S. 4 became law and hoped “that you and other Senate conferees will insist that the Senate position on this issue prevails.” On September 17, nearly five months after House passage of the bill, the conference report was issued. It provided for federal enforcement of water quality standards, but with the federal action subject to review by a joint federal-state conference board. On September 21, the House and Senate agreed to the conference report, and on October 2, President Johnson signed S. 4 into law. United States. Congress. Senate. Committee on Public Works. "Letter from Howard W. Cannon to Edmund S. Muskie Regarding the Las Vegas Valley Water Supply." Letter from Howard W. Cannon to Edmund S. Muskie Regarding the Las Vegas Valley Water Supply, May 3, 1965; “S. 4” folder, Legislative Files, Box 1; Committee on Public Works; 89th Congress; Records of the U.S. Senate, RG 46; National Archives.. Accessed 19 April 2019. http://acsc.lib.udel.edu/items/show/294. Letter from Howard W. Cannon to Edmund S. Muskie Regarding the Las Vegas Valley Water Supply, May 3, 1965; “S. 4” folder, Legislative Files, Box 1; Committee on Public Works; 89th Congress; Records of the U.S. Senate, RG 46; National Archives.